A shocking magical effect , which will always catch the attention of your audience. An empty cage stays in the center of the stage. The magician approaches it and sets the interior on fire. The magician covers the cage with a foulard. Immediately the cover is removed and a beautiful girl appears. 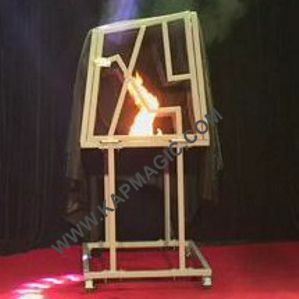 This is the most favorable Fire Cage Illusion for instantaneous Production. The cage is made of metal, sturdy and secure. All parts are folding for travel. In few minutes assemble time. Only one person can assemble this illusion. If you are looking for blazing Effect this is the best! It can be watched from all sides. Through it has small size ,it has strong effect that can catch the spectators attention. What is more, it is much easier to carry for your performance. A cage, torch , foulard and online teaching video are included. Notice: The height of the performer should be under 170 cm.